For the chicken casserole, place the chicken into a large ovenproof pan or casserole. Add the carrot, onion, peppercorns, herbs, stock and white wine and bring to the boil. Season, to taste, with salt and freshly ground black pepper. Remove the chicken from the stock (reserving the stock) and place it onto a large plate. Remove all the meat from the carcass, discarding the skin and bones. Cut the chicken meat into strips approximately 1cm/½in wide and 5cm/2in long. Cover and keep warm. Strain the stock into a clean pan and discard the vegetables, peppercorns and herbs. Add the cream to the pan, bring up to the boil and boil, uncovered, for a few minutes. If the flavour is a little weak, boil for longer until reduced slightly. Season, to taste, with salt and freshly ground black pepper. Meanwhile, heat a saucepan over a medium heat and place the butter into the pan. When the butter has melted, add the flour, stirring continuously. Cook over a low heat for two minutes to form a roux. While the cream sauce is still boiling, gradually whisk in the roux - you need enough to thicken it so that it just coats the back of a spoon. Place the chicken and any juices back into the pan and season, to taste, with salt and freshly ground black pepper. Meanwhile, for the pilaff, heat the butter in a saucepan large enough to contain all of the rice. 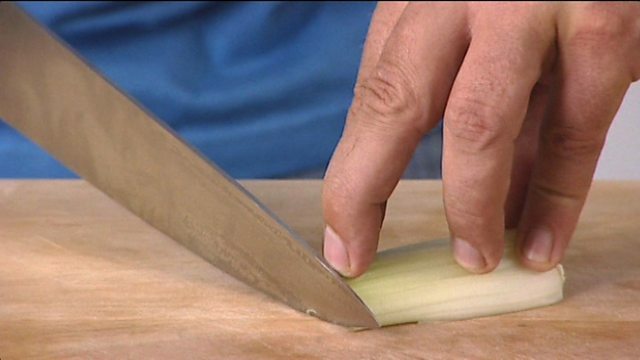 Add the chopped onion, put on the lid and cook over a low heat for about ten minutes, until the onion is soft. Add the rice and stir for about two minutes. Add the stock and season, to taste, with salt and freshly ground black pepper. Bring to the boil, then turn the heat right down and simmer gently for about ten minutes, or until the rice is just cooked and all the liquid is absorbed. For the salad, wash and dry the leaves and flowers and then tear them into bite-sized pieces. Place into a salad bowl. Place all of the remaining ingredients into a lidded jar, seal and shake to mix. Drizzle the dressing sparingly over the salad and stir to coat the leaves. To serve, pile the rice and salad onto serving plates and spoon the chicken casserole over the rice.